Treaty Oak exists. 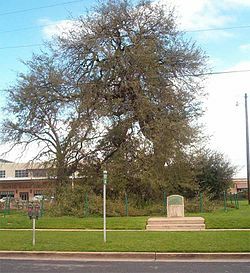 It’s a real tree in downtown Austin that was once a member of a huge group of trees called the Council Oaks, a gathering place for Native Americans for hundreds of years. It was a mere sapling when Leonardo Da Vinci painted the Mona Lisa. By the time Pocahontas sailed for England, Galileo glimpsed the moons of Jupiter , and Milton wrote “Paradise Lost,” it was a venerable old tree in the wilds of the yet unexplored (by Europeans ) North American West. At an estimated age of over 500 years, its canopy stretched nearly 130 feet across–and the sense of majesty and age was palpable. In 1989, city arborists became alarmed at the tree’s appearance–something was clearly wrong. An investigation revealed that the ground around the tree was saturated with a powerful herbicide, and Treaty Oak, the last of the Council Oaks, was dying. The city poured its heart and resources into saving it. Private and public citizens –remember Ross Perot?– donated vast sums to help; Dupont, the maker of the herbicide used in the attack, offered a $10,000 reward for the vandal. Shades were erected around it to protect it from the sun, earth was removed from its roots, sugar water was pumped in to help detoxify the soil…and tragically, dying limbs were cut from it to help save its life. A protective fence was erected around the park it occupied, and soon they were solid walls of fluttering white, teddy bears and protective talismans–people from all over the world sent their prayers and get well wishes. The herbicide that had been applied to the soil was soon traced back to a man named Paul Stedman Cullen, a ne’er do well and drug addict who bragged that he had killed Treaty Oak by way of casting a magic spell—his theory was that as the tree died, so would his unrequited love for a woman he admired. He was sentenced to nine years in prison, and there reportedly was accorded the reception that his fellow inmates generally reserved for child molesters. He made parole a few years later, and his whereabouts are currently unknown. Good riddance. 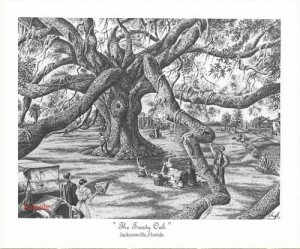 Given the bleak outlook, the extreme pruning it was forced to endure, Treaty Oak’s death was forecast and mourned in national publications—but there is a reason for the phrase “tough as oak”. After nine anxious years–ironically, the amount of time its would-be murderer would have served had he not been paroled–Treaty Oak , greatly diminished but still standing, produced its first crop of acorns, which were gathered up and sprouted for people around the world to plant scions of this once magnificent tree in their own yards. And if you come to Austin, you can still walk over to the corner of Baylor and Sixth street, and stand in its healing shade. Protected by Invisible Defender. Showed 403 to 69,960 bad guys.